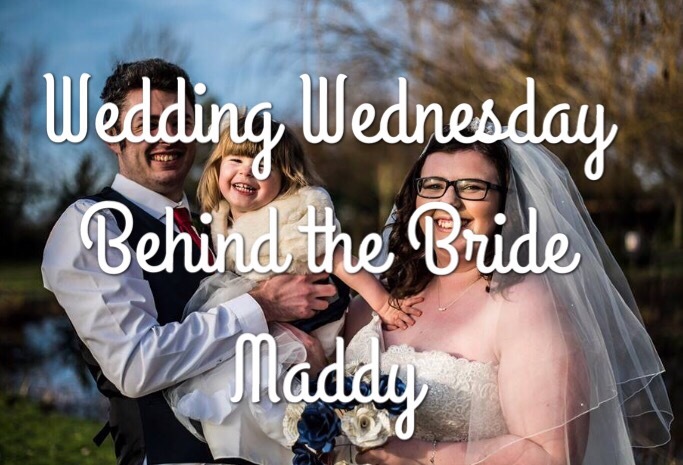 This week I’m chatting with the lovely Maddy from The Speed Bump about her recent wedding! Thank you! The big day was on December 18th 2016. We met through a theatre group. It’s quite funny, I was 13 and had just joined the theatre group; his parents ran it so he was a bit of a teacher’s pet. The first thing he ever said to me was “Be quiet!”, because he thought I was chatting. I went home and said to my mum, “I like everyone there except that Daf, I don’t think I’m going to get on with him”, and he clearly thought I was irritating – now look at us! We got together in 2010 and we’ve never looked back. Daf proposed on my 18th birthday. We were on holiday with my family in South Wales, and at sunset he took me for a walk to the beautiful beach in Porthcawl and asked me to marry him! It was lovely, intimate and romantic. 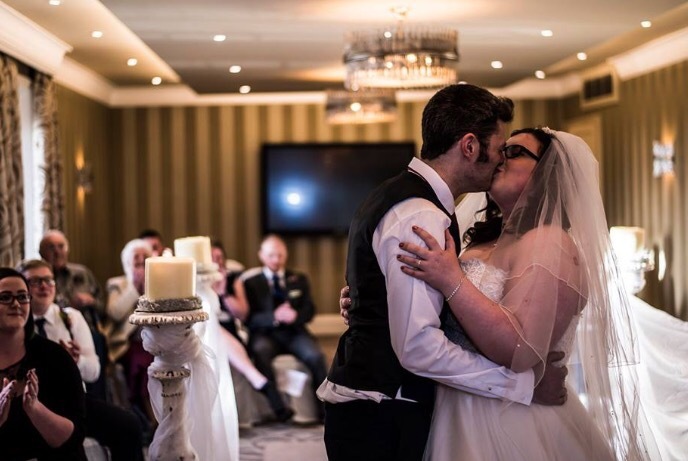 We got married at the Grosvenor Pulford Hotel & Spa, an absolutely gorgeous luxury hotel in Cheshire. As soon as we saw it, we fell in love with the venue and knew it was perfect for us. 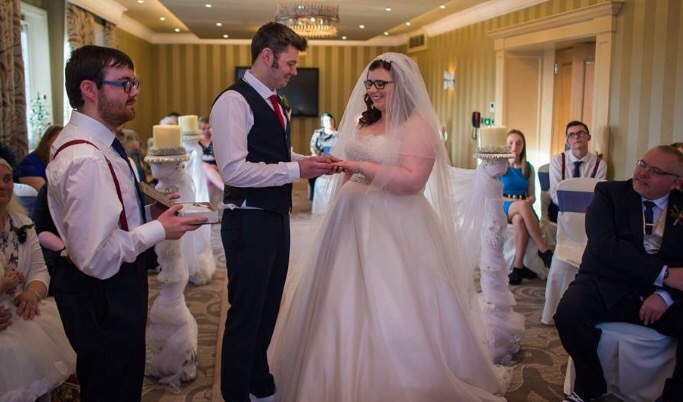 We’re both total geeks and we both love Christmas, so we combined the two to get our wedding theme – a Christmassy winter wedding with plenty of geeky touches! Our colour scheme was red, white and blue – purely because we like the colours and they went well with our theme and we could have lots of little touches in these colours – my bridesmaid was in navy blue, Daf and his best man wore navy trousers and waistcoats and red ties, and the ushers wore shirts with red braces, blue ties and navy trousers, instead of formal suits. 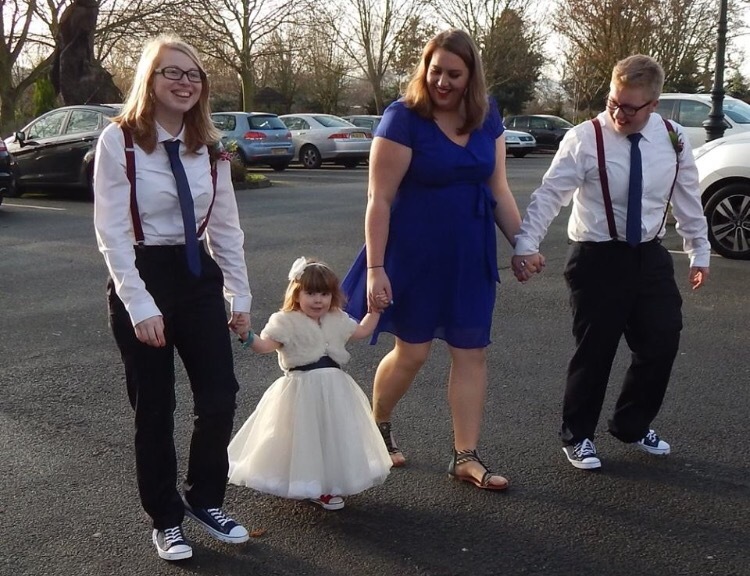 It was really relaxed and lovely – all of us, including my mum and dad, wore Converse in the wedding colour scheme! I keep going over things in my head that happened that were just amazing, but I’d have to say the wedding ceremony was the best. I walked down the aisle to “Romantic Flight” from How To Train Your Dragon, and as soon as the music kicked up and I walked into the room with my dad and saw Daf, the tears started! The ceremony was lovely and relaxed, lots of laughing (and lots of happy crying! 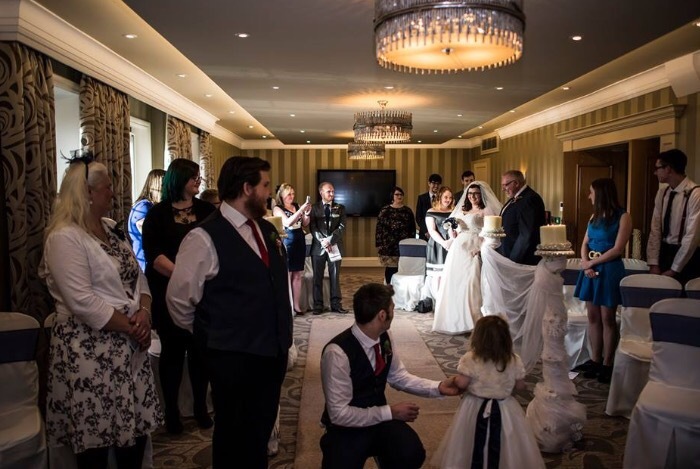 ), especially as our little girl Celyn was able to just wander around the ceremony room and amuse herself! Everything was fantastic, though, right down to the morning after – lots of us stayed at the hotel on the night of the wedding so we all ate breakfast together the next morning. It made it feel like an amazing weekend away with all our closest family and friends. 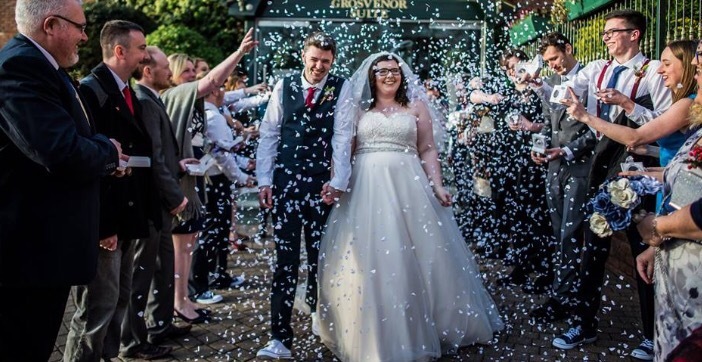 The only thing I can think of is that some guests didn’t turn up, and we’d paid a lot for their meal etc – but that’s not something you can prepare for, and it definitely didn’t ruin our day. Those who were there had a great time and it was absolutely amazing. One thing I’d do differently is not to get involved in any drama leading up to the big day. I did a good job of staying out of it, but ended up having to send one relative an email four days before the wedding explaining the very good reasons why he wasn’t invited, because he’d kicked up such a fuss and caused a massive family drama about it. 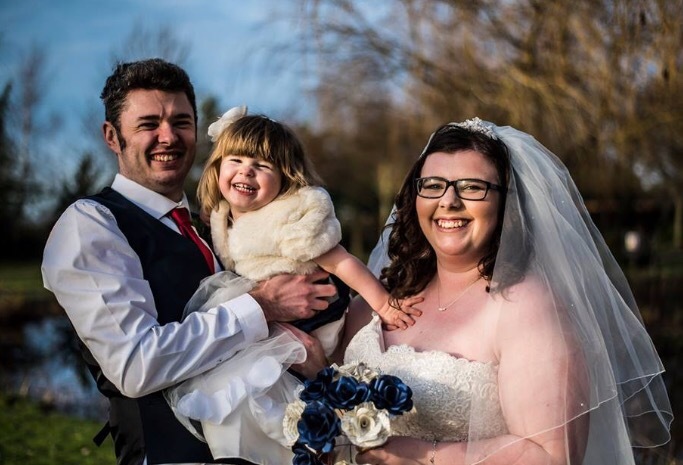 I’d just disengage, so I could enjoy the run-up to the wedding as much as I enjoyed the day itself! Enjoy the planning. Remember that it’s yours and your husband-to-be’s day, no-one else’s. You don’t need to have anyone as bridesmaid/usher if you don’t want them; you don’t need to have random people as all-day guests because your parents want them there; we made it clear from the start that we were paying so we were making choices and no-one had any problem with it whatsoever. Oh, and take ten minutes to escape from it all! Daf and I took ten minutes out of everything between dinner and the party, to sneak outside and take it all in. We stepped outside and the bells in the church across the road were being rung for practice; it was a beautiful moment and so nice to just take the time to breathe and be together. Thank you so much for chatting with me Maddy! 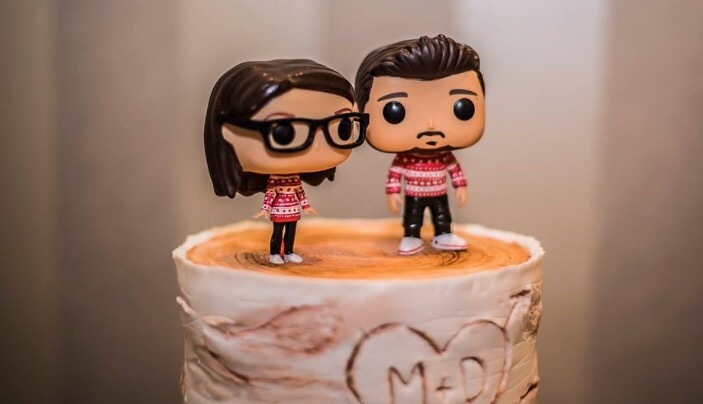 Wedding Wednesday – We’re Getting Married this Year!